Overlaid on top of the main graph for the local Monitoring Station is a National Radiation Map, where each colored circle represents a Radiation Monitoring Station at that location on the Map. The numerical value displayed in each circle represents the Radiation Counts Per Minute (CPM) for that station during the last minute, which value updates every minute. If any station detects a dangerous Radiation level, then an Alert symbol appears over that station, accompanied by a pop-up visual alert and an audible alert (play this Remote Alert sound file). Thus, you can see that by using this software, you can immediately know the Radiation levels in real time anywhere in the US where there is a monitoring station participating in this Network, and obtain immediate, real time notification of any dangerous Radiation level detected!!! Meanwhile, the graph window at the lower left of the Main Screen represents the graph of a representative Remote Monitoring Station, providing minute by minute Radiation detail, as well as access to a log of the data by spreadsheet, along with detailed identification information for that station. A Remote Graph like this is readily available for every station shown on the Map. 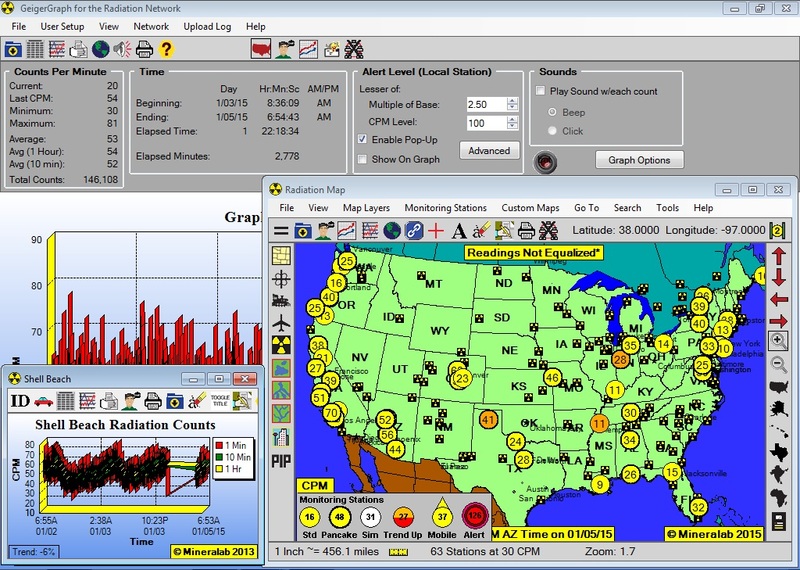 Although the picture above shows a static map, the Radiation Map is fully interactive, with zoom capabilities, descriptions of Nuclear Sites and Monitoring Stations, additional Map Layers, including Counties, Airports, Roads, Railroads, Lakes and Rivers, and even the capability to download City Streets for your county. Plus, in keeping with the elements of a true Network, the Radiation Network software has its own Chat forum. Global Map: The Radiation Network is global, with Monitoring Stations in Europe, Asia, Latin America, etc, and the program includes a global map, showing all countries in the world, along with major cities, and most Nuclear Sites in those countries. This makes possible a truly universal Radiation Network, where monitoring stations can operate from any country and share their data with those in the United States, and vice versa. GPS Enabled: The Radiation Map incorporates a GPS feature, where plugging a compatible GPS device into your computer turns your station into a mobile detection vehicle. 2.) Or, if you are a municipal Fire Department in a large city, for instance, you could set up a network of Radiation Monitoring Stations at key locations around the city, such as harbors, piers, tunnels, bridges, airports, etc. and monitor the Radiation level at each site in real time from a central station, receiving any Radiation Alerts that may arise, so that you can take immediately action to control potential exposure. Because the Radiation Map is fully interactive, you can zoom in and keep the Map at the zoom level for just your Metropolitan Area, or zoom in further at any time down to the City Street level. 3.) Or, a Community Group could set up Radiation Monitoring Stations around a nuclear power plant, for instance. You could zoom in on the Radiation Map to just the region around the Nuclear Power Plant, showing your community group's network of monitoring stations, and even upload that Regional Map and your Graph(s) for viewing by the general population in your area. Order Radiation Network software above. The software will be issued by download. Your order will typically be processed within 1 business day. We will send Registration instructions by separate email when your order is processed. If you need a Data Cable, choose that also from Related Products. Note that the Inspector USB, Inspector EXP-USB, and the Digilert 200 already come with a compatible USB cable. However, the Observer brand of software that comes with the Ranger, EXP, and Digilert 200 is not compatible with the Radiation Network. I purchased two "GMC 600 Plus" units both containing the LND-7317 ... AND ... I can say with confidence that they are the Best-Bang for the Buck. The counts I am receiving at my current altitude of 6,047-feet are within a couple of counts of expectation .. 59 and 61. (expectation was 57 to 58). The GQ Owner/Developer made a change that I had suggested to it's Firmware (Upgraded-Version 1.19). They both originally came with Version 1.17. The Version-Upgrade (1.19) related to CPM-Pulse-Data through the Data-Port thereby eliminating the need for the Audio-Port and Audio-Cable if/when desired ... AND ... In My Opinion, this is a much, much more accurate way of obtaining CPM-Pulses. I am sending their data to both Radiation-Network.com and NetC.com ... AND ... both GMC displays now perfectly match the window of RadiationNetwork and NetC's software at the end of each minute! Both of my "GMC 600 Plus" Units containing the LND-7317 Geiger-Tubes are now within 2-inches of each other with the geiger-tubes horizontally facing down, 3-inches above a heavy-plastic folding table ... and with an indirectly-pointed 4-inch usb-personal-fan 2-feet away to guarantee air-flow around both units at my location in Montrose, Colorado, USA.